William Bearden III M.D., F.A.C.S. 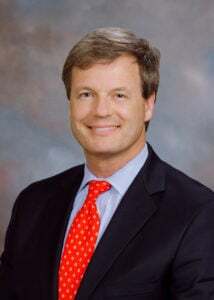 William H. Bearden, III, M.D. is board certified by the American Board of Ophthalmology and specializes in plastic and reconstructive eye surgery. He completed his specialty fellowship in Salt Lake City, Utah, and his ophthalmology residency at the Callahan Eye Foundation Hospital at the University of Alabama. Dr. Bearden is an Alpha Omega Alpha graduate of the University of Alabama School of Medicine. This was followed by an internship at Roanoke Memorial Hospital in Roanoke, Virginia, as well as an externship in Vienna, Austria. A native of Alabama, Dr. Bearden completed his undergraduate studies as a Presidential Scholar at the University of Alabama. He is a member of the American Academy of Ophthalmology, the American Medical Association, and the American Society of Ophthalmic Plastic and Reconstructive Surgery. Dr. Bearden, along with Dr. Langelier, is part of the team at our brand new Aesthetics Center.